What is it? A collectible card game with tabletop tactical elements. My Sister of the Bear is a massive woman. She wields a bearded axe that's just as big as she is, and right now she's only a turn away from smashing an idol with one health point. My opponent is outnumbered and blocked by numerous weaker minions—I have this. And then the worst happens. The enemy player lays down a scroll that makes a gale sweep throughout the board, damaging all minions equally, and he launches some kind of missile that smacks my hero down with the cold weight of technology. Suddenly, I'm the one who's afraid. Cue flashback. I'm hunched over a chessboard on the brittle tables of my middle school cafeteria (nerd that I was), frantically trying to figure out how my best friend could have called out "checkmate" when I'd planned everything so well. Scrolls delivers many moments like this precisely because it feels a little like the game of kings; for more modern sensibilities, it's just as well to think of it as a mashup of Magic: The Gathering and Might & Magic. In the menus and shop, Scrolls looks much like many of the other digital collectible and trading card games that have popped up over the last few months, but in matches, it benefits from a tactical element that has you play the minions represented by your cards (erm, ‘scrolls’) on a hexagonally gridded field with five idols each with 10 hit points on both ends. Knock out three of the idols, and you win. It seems like such a small change, but the resulting need for careful thought elevates it in some regards above the Blizzard's ultra-popular Hearthstone. Naturally, that means it's a tad tougher to pick up compared to Blizzard's beast. An extensive series of tutorials adequately eases you into the waters, but I readily admit that I spent hours battling the decent AI in skirmishes and trials (‘puzzles’) before I felt comfortable jumping in with real people who might mock my placement of a barrier or a Brother of the Wolf. (Happily, the community's not anywhere near as bad as all that.) Scrolls isn't just about which card trumps another; it's also about moving avatars to new lanes after they've destroyed an idol on another. It's about blocking and rushing and buffing. The payoff is that every win feels like it's born of my mind and not my luck. Scrolls does much to nurture this feeling. It avoids the bummer of running out of cards in a traditional card game by letting you sacrifice a scroll once per round to bump up your mana a tad or to trade it out for two different scrolls from your deck. (Or, you know, play it.) It only supports four decks—Growth, Order, Decay, and Energy—but they all cater to certain playstyles and aesthetic preferences. I tend to play as Growth, but that's mainly because I like the scruffy Viking look of its primitive representatives, each drawn on scrolls with imagery that captures the spirit (if not the detail) of Magic: The Gathering's artwork. If I'm in the right mood, I gravitate toward the Energy deck, full of steampunky "machine priests" and built around a heavy hitting philosophy. I enjoy them all, in fact, with the caveat that they don't play well together in mixed decks. Since each 50-card deck can only draw from its own resources, mixed decks bog down in an awkwardness that doesn't exist in decks of a single type. There's little evidence that Mojang cares about the competition, and that's what makes Scrolls appealing. That wouldn't be so bad, perhaps, if it didn't exacerbate a preexisting problem. 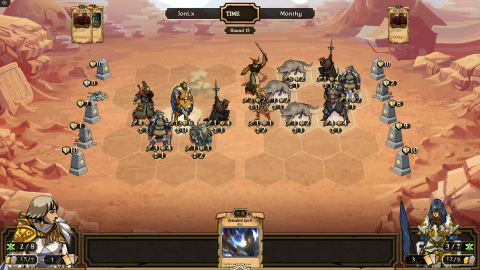 Much like those chess matches in my middle school cafeteria (which I rarely finished before the bell rang), Scrolls suffers from plodding pacing that drags matches out for the better part of an hour. Much of this springs from the need to demolish the three idols, which grows challenging when you're up against a player that knows the slightest thing about slapping down barrier scrolls or tanky minions. Turns in multiplayer matches last for 90 seconds, and many players insist on savoring every last one before clicking the hourglass to end the turn. And sorry, Mojang: I don't think there's any way this tortoise is going to catch up with Blizzard's hare. But here's the thing—there's little evidence that Mojang cares about the competition, and that's what makes Scrolls appealing in spite of its pacing problems. For months word circulated that it would cost 20 bucks, but now that it's here, it costs a fourth of that—just $5/£3. It gets better. The premium "shards" you buy with real cash only purchase customizable avatars, random daily cards, and preconstructed decks, but Mojang lets you buy all scrolls in the game with the gold from your winnings. In contrast to certain other games, the gold piles up quickly. Winning matches against the AI is usually enough to net you enough gold to buy at least one scroll, and buying full packs with scrolls from all four decks doesn't take much longer. All things considered, Scrolls is easily one of the most generous collectible card games on the market, and it even lets you freely buy and sell cards with other players with gold on the "black market." So, where is everyone? Here's a game that bucks the trend everyone complains about and it's like Washington D.C. in Fallout 3. Matches pop up quickly enough, but once I even played against the same guy twice in a row. It makes for a community that feels like a group of close buddies who play cards together every night, but that means frightening things for Scrolls' future. Perhaps that pacing really is enough to drive everyone away. Perhaps it's marketing. Whatever the reason, it shouldn't be enough to dissuade you from trying out Mojang's mildly cerebral CCG if you like some tactics in your cardplay. So head on over—the community will wait. At this point, they're used to it. Mr. Verzuvius, tear down that wall! The Medium AI is a pushover, but it's mainly there to help grind gold. Buy and sell scrolls from other players with ease. Need new cards? No problem! Scrolls practically throws gold away. Retire your, ahem, elder scrolls with the deck builder.